Club news: Meetings continue at the Chamber of Commerce in Bartlett Parking lot on the second & fourth Tuesday of the month at 6:00 PM. The next meeting is December 11th at 6PM, No meeting on November 26th. We will probably go to one meeting a month until March. Last newsletter. This is the last newsletter from me, as discussed in the meeting Nancy and I are giving up our positions this year, we have been doing it for 2 years and want a year off. Discussed in the meeting was to have all news posted on the blog. Geoff called today and said that Ruthann was going to do treasury so we will give that to them next week. Nancy talked with Geoff and agreed to do Registration and head up the Raffle committee for next year’s car show. Now all we need is someone to do 50/50 for the meetings. Also we have some computer files that need to be kept up, such as phone list, membership list etc. Thank you Ruthann for volunteering for treasurer. Looks like things are winding down at show and shine at Get the Burger; this will probably stop shortly due to weather and getting dark very early, but will return in the spring with even more cars and support. Looks like things are winding down for winter and the Holidays. I hope everyone has a great time through the holiday season. Larry is working on the details for the L.A. Car Expo and will let us all know the details later. Our best wishes go out to Larry with his medical problems. Club news: Meetings continue at the Chamber of Commerce in Bartlett Parking lot on the second & fourth Tuesday of the month at 6:00 PM. The next meeting is Sept 25th 2012. There was general discussion on the results of our car show on Labor Day weekend and some possible changes to the show for next year. Cancelled and discussions for when and where were tabled until the next meeting which is on the 25th of September. We had a 50/50 at the end of the meeting and Javier won it. Yucaipa car shows- 2 shows remain for this year- October 5th and Nov 2nd- The November show is the annual toy drive which our club attends. Club news: Meetings continue at the Chamber of Commerce in Bartlett Parking lot on the second & fourth Tuesday of the month at 6:00 PM. The next meeting is Aug 21st 2012. The club decided to meet every Tuesday at the chamber until our car show on Labor Day weekend. The meeting next week will be mainly discussion about the car show. All committee members are urged to attend, Geoff will be calling you. The meeting the following week Aug 28th will be a general club meeting and final preparations for the car show. The club did a show and shine last Wednesday 8/8/12 at “Get the burger” lower turnout was expected due to possible rain showers, but it didn’t rain and we had about 15 cars. Eric has bought a popup for us to sit under and had that set up, also we had a model taking pictures with the cars and the same model is also coming to our car show. Tonight is another cruise night and should be good. 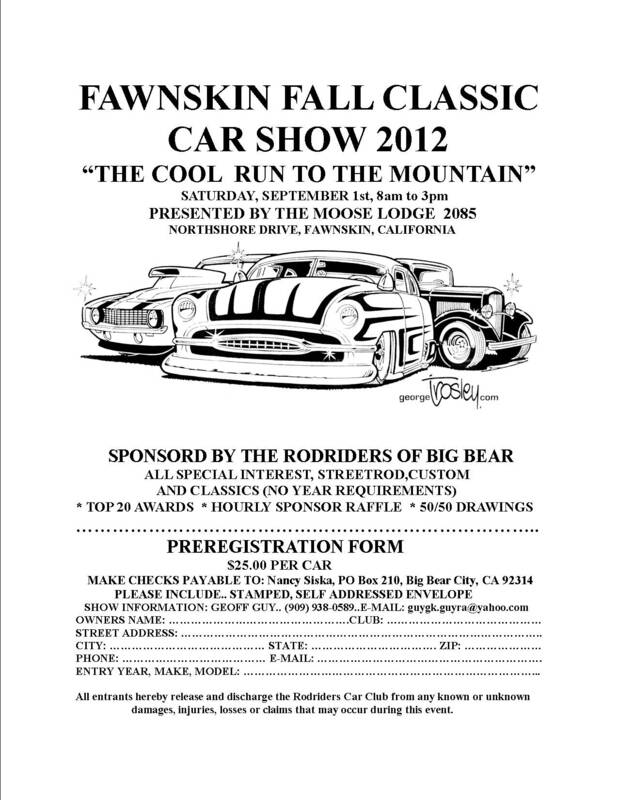 I am taking flyers to the Wrightwood car show this weekend. Registrations are still coming in and most sponsors have paid (Thanks Geoff great job). Nancy and I are going to Harbor Freight this Friday to buy car stuff for the raffle and Napa and CARQUEST are donating car products, plus we are getting various raffle donations of services from around town. The club has asked that all members donate at least one raffle prize for the show as we did last year. We had a 50/50 at the meeting last night and Joe Siska won. Club news: Meetings continue at the Chamber of Commerce in Bartlett Parking lot on the second & fourth Tuesday of the month at 6:00 PM. The next meeting is Aug 14th 2012. The club did a show and shine last Wednesday 7/18/12 at “Get the burger” because the weather was nice and it wasn’t raining yet. Approx. 20 cars showed up from around town between 5 and 7PM. It was fun to see everyone and visit and talk about cars. Cruise nights are every Wednesday at Get the Burger from 5PM until 7PM. Eric has put up a Banner that announces that Wed is cruise night. Tonight should be a good showing of cars. The latest on our car show is that Geoff is still distributing flyers and is getting and has the dash plaques and car registration cards. They were very nice looking, good job Geoff. Geoff has requested that the club members send in their $25 plus registration form for the show, either send it to Nancy by mail as described on the form (which you get off the blog or get one from Geoff) or give it to Geoff. Members are also asked to start collecting Raffle prizes for the raffle, each member is asked to donate at least one raffle item. Eloise is our raffle person this year so contact her on your items. Pat has already agreed to donate another Carved BEAR this year. Also if you have sponsors that you can get to contribute, please do so. Geoff and Joe plan on distributing flyers at the Yucaipa show Aug 3rd, those that are going and want to drive together will meet at Geoff’s house at 3:30 PM. The theme for this show is bring your kids. The Do-Dah Parade is July 28th in Fawnskin, all participating club members are ask to show up at 9AM for lineup, the parade starts at 10AM. Ron king is trying to get the explorers to carry the Banner, club members are asked to donate $5 towards the cause. Larry Huffman is home, Dave and Ron King helped arrange a few things around his home so he can get from his house to office easier. We all wish Larry a speedy recovery. Old miner’s day parade was July 21st at 3PM, we all arrived around 2:15 to 2:30PM- there were nine cars with our club in the parade. As always there were a few overheats. Looks like Drive Magazine list our call show in their magazine. Ron King got the banner from Kenny for the 2 parades and will be given back to Kenny after that. First come first serve. Go back way to get in- Knickerbocker to top right to Pine Knot then to street behind theatre to Jack in the box. Club news: Meetings continue at the Chamber of Commerce in Bartlett Parking lot on the second & fourth Tuesday of the month at 6:00 PM. The next meeting is July 24th 2012. The club did a show and shine last Wednesday 7/11/12 at “Get the burger” because the weather was nice and it wasn’t raining yet. Many cars showed up from around town between 5 and 7PM. It was fun to see everyone and visit and talk about cars again. Cruise nights are every Wednesday at Get the Burger from 5PM until 7PM. Eric has put up a Banner that announces that Wed is cruise night. The latest on our car show is that Geoff is still distributing flyers and is getting and has the dash plaques and car registration cards. They were very nice looking, good job Geoff. Geoff has requested that the club members send in their $25 plus registration form for the show, either send it to Nancy by mail as described on the form (which you get off the blog or get one from Geoff) or give it to Geoff. Members are also asked to start collecting Raffle prizes for the raffle, each member is asked to donate at least one raffle item. Eloise is our raffle person this year so contact her on your items. Pat has already agreed to donate another Carved BEAR this year. Also if you have sponsors that you can get to contribute, please do so. The Do-Dah Parade is July 28th in Fawnskin, all participating club members are ask to show up at 9AM for lineup, the parade starts at 10AM. .
Larry Huffman is coming home Monday July 16th, Ron say’s KC will need some help to lay down horse pad so Larry can walk over gravel to his office. Let’s help KC out when Ron calls us. Old miners day parade is July 21st at 3PM, Ron King will give us more info on where to meet and at what time. Thanks Ron. Ron King is going to ask Kenny for the Banner for the 2 Parades. Club news: Meetings continue at the Chamber of Commerce in Bartlett Parking lot on the second & fourth Tuesday of the month at 6:00 PM. The next meeting is July 10th 2012. The club did a show and shine last Wednesday 6/20/12 at “Get the burger” because the weather was nice, nineteen cars showed up between 4:30 and 7PM. It was fun to see everyone and visit and talk about cars again. Cruise nights are every Wednesday at Get the Burger from 4PM until 7PM. The next Yucaipa car show is coming right up and is July 6th. If anyone is interested in going let me know and we will set up a caravan. The latest on our car show is that Geoff is still distributing flyers and is getting dash plaques and car registration cards made. Geoff has requested that the club members send in their $25 plus registration form for the show, either send it to Nancy by mail as described on the form (which you get off the blog or get one from Geoff) or give it to Geoff. Members are also asked to start collecting Raffle prizes for the raffle, each member is asked to donate at least one raffle item. Eloise is our raffle person this year so contact her on your items. Pat has already agreed to donate another Carved BEAR this year. Also if you have sponsors that you can get to contribute, please do so. The Do-Dah Parade is July 28th in Fawnskin, all participating club members are ask to show up at 9AM for lineup, the parade starts at 10PM. 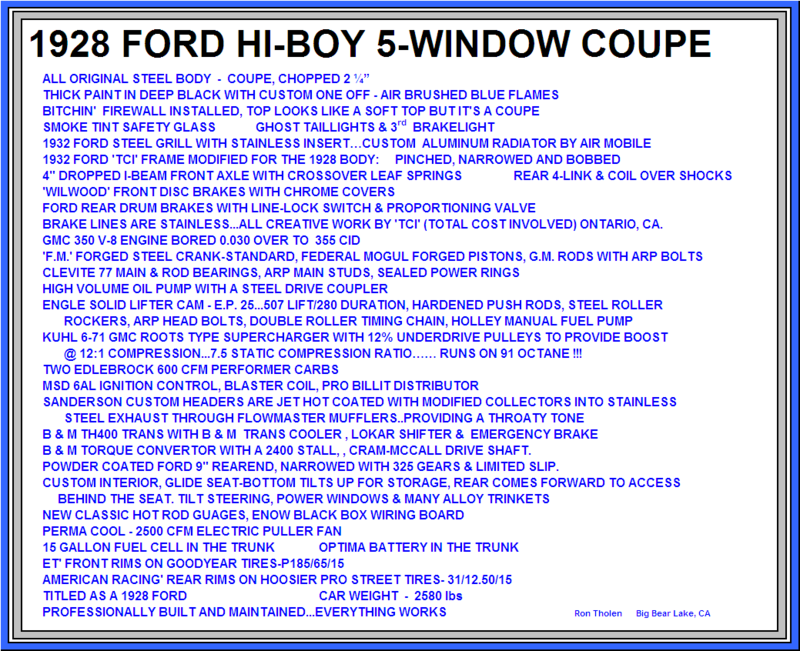 Please RSVP the e-mail this newsletter is attached to so Nancy and I can take a count of how many cars are coming. This is a fun parade so let’s up show up as a club and have some fun. Larry Huffman is out of the Hospital and in a rehab; the club wishes him a speedy recovery. Yucaipa Cruise Night- Every fourth Friday from 6 to 9PM- No entry fee- In uptown Yucaipa. Club news: Meetings continue at the Chamber of Commerce in Bartlett Parking lot on the second & fourth Tuesday of the month at 6:00 PM. The next meeting is March 27th. The club did a show and shine this Wednesday 3/14/12 at “Get the burger” because the weather was nice, six cars showed up between 4 and 6PM. It was fun to see everyone and visit and talk about cars again. The club is still collecting dues and only a few members are still outstanding, dues are $30. The Yucaipa car show is coming right up April 6th and the club will be forming up at 3PM at Geoff’s house and will leave around 3:30PM. Show is from 6 to 9PM but we need to get there early in order to get some good parking spots. Final discussions on whose going ec.t will be at the next meeting. We are now starting to discuss our car show for this year with some preliminary plans have been made. We will be getting t-shirts that are a bright color with our logo and STAFF on them. Some of the volunteers are as follows: Geoff- Leader- Coordinates, flyers and sponsors. Remember we still need more volunteers to help the people list above and each members should donate a raffle prize as we did last year also Pat is going to try to get a bear again this year and it was discussed that we will go to Harbor Freight to buy some auto stuff for the raffle, plus we usually get some items from the sponsors. We were all sorry to hear that Ron King was in the Hospital and hope that he is doing well; all our blessings are with him. We had a 50/50 drawing that collected $28 and Geoff won and took home $14. Gas on the Grass- April 21st at Victor Valley High school, Nancy has flyers.